Learn behavioural problems like barking and digging and how rewarding your pet can correct them. Learn how to gain control in tricky situations. Understand animal psychology and what triggers your dog to act out. Learn principles of reward-based training. Understand separation anxiety in your pet. Learn how to praise, play and relax with your dog. Build a strong bond with your dog by training him and rewarding his good behaviour. You can enjoy a happy dog all the days of its life. Your dog should love you not fear you. This is the #1 rule for pet owners and dog trainers. Learn advanced training techniques and practical skills to correct bad behaviour and make your dog happy. The Advanced Diploma in Dog Behaviour and Training – Level 3 is a comprehensive training that will enable pet owners and animal carers to understand your pet’s psychology and learn how to deal with their behaviour. Once you understand reward based training, you and your furry friend will be both very happy! The course will enable learners to understand certain habits of their pet dog and what triggers these habits. You will also learn how to teach your dog to slowly move away from unhealthy behavioural patterns using basic commands. The Advanced Diploma in Dog Behaviour and Training – Level 3 will cover key topics on dog psychology, how dogs respond to rewards, small dog syndrome, correcting problematic behavioural patterns and understanding basic training. The course will teach learners how to resolve disruptive behaviour and get back to enjoying a warm and fuzzy pet that is always happy. The course is for professionals in the pet industry and animal lovers who want to learn animal psychology and ensure they raise a happy and well behaved dog. Individuals who want to learn how to care for their dog properly. Anyone who wants to learn about reward-based dog training. 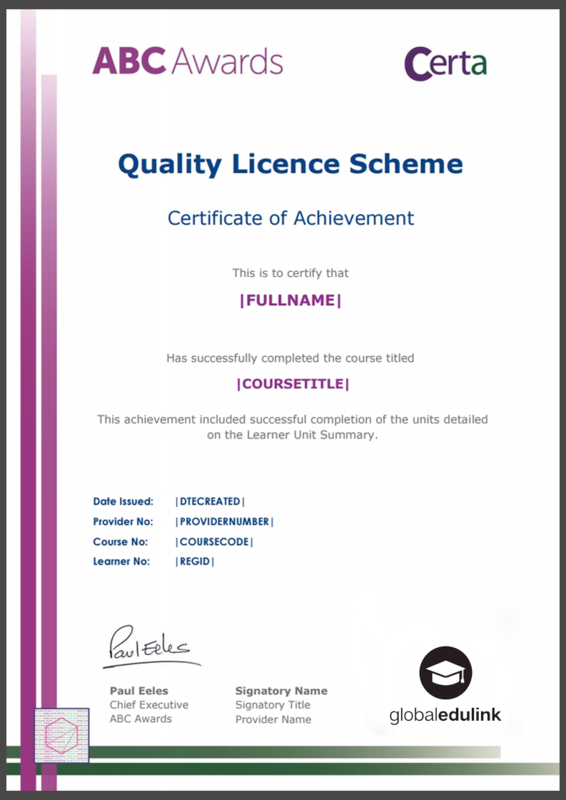 Progression and Career Path Once you successfully completed the Advanced Diploma in Dog Behaviour and Training Level 3 you can have a career in animal care. If you are interested in pet sitting, dog walking, dog grooming, working in animal shelters, or volunteering with animals, this qualification will give you a starting point to further your career path. 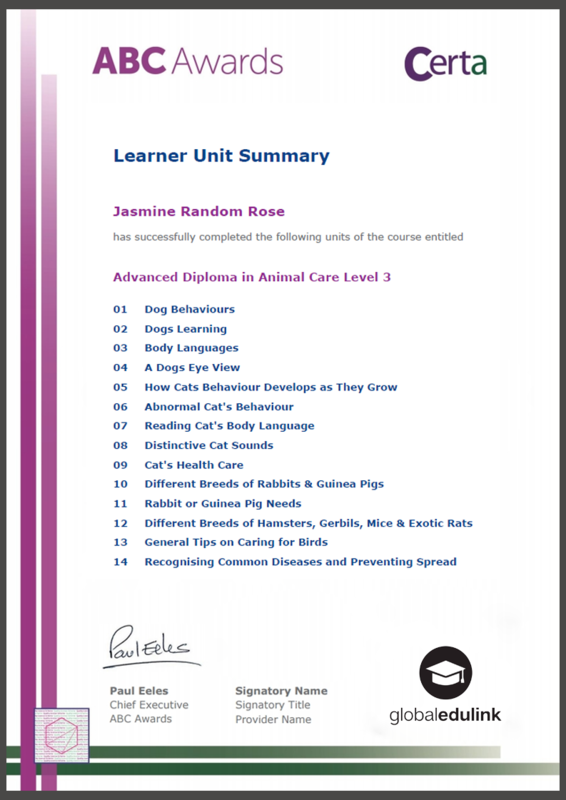 Animal care workers who are in pursuit of a promotion will also find this course highly useful. I couldn’t be happier with the structure, information and materials they provide. This course was really helpful for me to learn certain habits of dogs, for example, what tempts them the most, what makes them angry and etc. Overall this course was really useful. Thank you Global Edulink for your amazing support and quality content.